Evening fussiness was the bane of my existence when my kids were little. I vividly remember that come 5:00, any semblance of peace and order we had achieved during the day went out the window. If this is your experience too, you’ve already experienced what’s known as the “witching hour”. This is that time of the night – usually right around dinnertime – when your baby starts to become inconsolable and extra fussy. Sometimes it feels like there’s no cause or cure for evening fussiness. However, there are a few likely culprits which could be causing your baby to act extra sensitive and irritable during this time. Below I have highlighted the most common causes and laid out a few tips for you to help your baby settle. Colic is described as crying that lasts for more than three hours a day, occurs at least three days a week, and lasts for at least three weeks in a row. Colic only occurs in newborns, starts around 2-3 weeks of age, peaks at 6 weeks, and goes away by 3-5 months. The cause of colic is officially unknown, however, the latest research suggests that colic is a developmental stage rather than a medical condition. The intense crying of colic typically occurs in the evening hours. Many parents report that it starts anywhere from 5-11 pm and can last into the wee hours of the night. This is typically the time of the evening when your family is ready to relax and unwind from the day, which makes all this crying extra frustrating! Bounce on an exercise ball: This is the #1 technique I recommend for soothing a colicky baby, especially during the evening hours. The bouncing movement can be soothing to babies because it mimics the motions they felt while in the womb. Use loud white noise: Babies are accustomed to the noises of the womb. Once they’re born and are in the silence of a room with no noise, it can be unfamiliar and scary. White noise will help to soothe your baby and to recreate that comforting sound that they’re familiar with. Use the 5 s’s from the Happiest Baby on the Block: The Happiest Baby on the Block, written by Harvey Karp, MD., highlights the five s’s for soothing a fussy baby. These are great to use during the witching hour, especially if you suspect your baby is suffering from colic. For more on this, see Dr. Karp’s article Using the 5 S’s. Use a Fisher Price Rock n’ Play or Fisher Price Cradle n’ Swing: The Fisher Price Rock n’ Play Newborn Sleeper was voted number one on my recent survey, The Top Product for Fussy Babies. The Fisher Price Cradle n’ Swing was close behind at number four. Both of these products mimic the movements that your baby felt in the womb and will help them feel safe and secure. Breastfeed: Sometimes the only way to get through those fussy evening hours is to nurse the night away. This is commonly known as cluster feeding. We’ll cover this in more detail in #2 below. For more on what colic is and how to soothe a colicky baby, check out my free guide, 5 Things I Wish I Had Known About Colic. Many parents report that their baby wants to feed continuously in the evening hours. This is particularly true for 0-3 month olds. This “cluster feeding” may serve to help your little one fill up before their longest sleep (at least in theory, the sleep period at the beginning of the night is the longest). Oftentimes babies will appear restless while they feed in the evenings, taking small amounts then pulling off. This can lead you to doubt your milk supply or to question whether they’re actually hungry, gassy or maybe suffering from reflux. For older babies, moving to an earlier bedtime may help alleviate much of this fussiness. If he or she is going to bed earlier and is still fussy, however, a good, long feeding may be what’s needed to calm and comfort him, and to fill him up before bedtime. Allow your baby to nurse as often as he or she likes in the evenings, even if that means sitting on the couch for hours. If bottle-feeding, offer your baby the bottle until he or she doesn’t accept it anymore. While you may sometimes feel guilty or torn about “overfeeding”, breastfeeding frequently in the evenings also serves to increase your milk supply – so never ever feel bad about it! During the newborn period – especially if your baby is colicky – he’ll fall asleep when and where he wants. His sleep schedule may be all over the place, and with colic, there is little you can do about it. 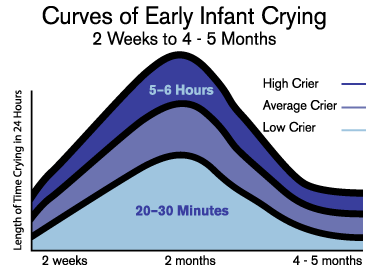 However, if your 3-5 month old is still going to bed very late at night, she may continue to cry in the evenings simply because she’s overtired. This is why when parents tell me their 6, 8 or 10 month old still has colic, the first thing I ask is, “What time does he go to sleep at night?”. But what if your baby never had colic? It’s important to note that around 4 months, babies begin to need to fall asleep earlier at night. This corresponds with that nasty “4 month sleep regression”, which really isn’t a regression at all; it’s actually just the age at which a baby’s sleep starts to more closely resemble adult sleep. After 4 months is the time to gently transition your baby out of the “sleep wherever/sleep whenever” thing and start watching the clock and thinking about using a bedtime routine. This is a great time to start instituting a bit more of a sleep routine, particularly following age-appropriate wake times. I also really like Eat, Play, Sleep to start establishing a more predictable pattern for the day. 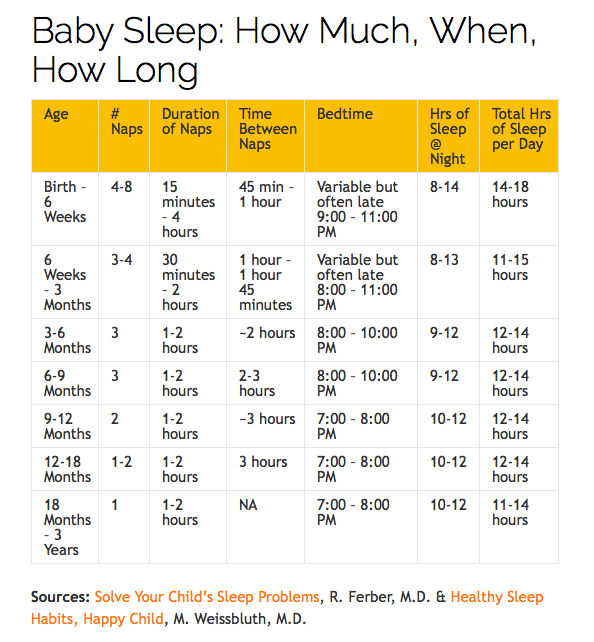 Many babies 4 months+ do best when they go to bed between 6:00-7:30. If your little still takes a third nap during the day, bedtime might be a little later than this. If your baby’s bedtime is significantly later than this, try gradually moving it up in 30 minute increments. Oftentimes, this can completely eliminate evening fussiness, as your baby is now fast asleep rather than fussing and crying because she’s overtired. This was the case with my daughter; when I finally got her sleeping by 6:00, her evening fussiness disappeared. And, contrary to what you might think, she still slept just as long at night! To ensure the best chance of falling asleep at bedtime, don’t allow napping after around 4pm. Although it’s tempting to let them nap through your dinner-prep, a too-late nap can seriously mess up bedtime! (trust me, I’ve been there). 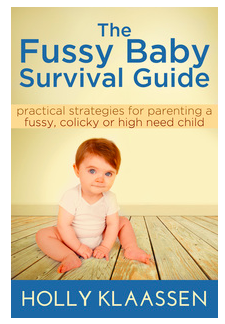 For tips on helping a fussy baby sleep, check out my free eBook, 6 Sleep Tips For High Need Babies & Toddlers. Many experts believe overstimulation is one of the key factors in colic and infant fussiness. All day, your baby has been dealing with the sounds, sights and smells going on around them; come 5pm, sensitive babies have had ENOUGH! (If you’re an introvert like me, you can also probably relate to this). In an attempt to recover from the stimulation of the day, these babies will cry, fuss and whine simply because their resources for coping are depleted. I have often wondered if these babies also cry in an attempt to drown out the stimulation around them. According to Dr. Karp, fussy babies tend to have less state control meaning they aren’t so great at maintaining balance. This means they have a harder time falling asleep on their own, staying asleep, calming themselves, etc. For this reason, it may be harder for them to naturally shut out the stimulation of the day. The result? Lots of evening crying! Take your baby into a dark room (I highly recommend blackout blinds), and cut out all unnecessary noise and stimulation (TV, nursery projector, nightlight, etc). This does NOT mean making everything still, calm and quiet, however. Fussy babies often need loud white noise and rigorous movement in order to calm down. Remember that when they were in the womb, they were used to lots of noise and movement, 24/7. It sounds counter-intuitive, but oftentimes a baby who is over-stimulated doesn’t need all stimulation to go away – they just need the right KIND of stimulation. For younger babies, a snug swaddle can help calm the startle reflex, which may hinder the process of calming down. Swaddling, holding them up on your shoulder, and then bouncing on an exercise ball can work wonders. Many parents also swear by the Fisher Price Rock ‘N Play to help their newborn settle and sleep. For older babies who have outgrown the swaddle, the Baby Merlin’s Magic Sleepsuit may be a better alternative to a regular blanket. Using loud white noise is also recommended, right into toddlerhood. The “witching hour” can be a tough time for both you and your baby, whether it’s because of colic, overstimulation, or any of the other reasons I covered. It can be especially hard because YOU’RE likely tired as well, meaning your own emotional and physical resources are low too. Do your best to remain calm while trying to soothe your baby, and test out the tips above. Finally, keep in mind that even though it feels like this will last forever, the “witching hour” will eventually end. How do I know if my baby is colicky, high need, or something else entirely? Will my high need baby ever get easier? And if so, WHEN? Is “high need” a real thing? Is there any research to back it up? What are the most effective strategies for helping my high need baby sleep? How do I deal with my child’s INTENSE tantrums? For more info or to grab your copy now, click here! Special thanks to Alexa of Precious Little Sleep for the great sleep chart above.